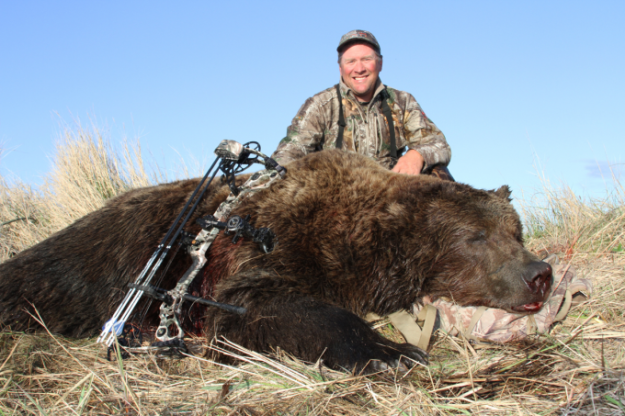 Friday the 13th may not be the ideal date to be hunting one of the world’s largest predators with a bow, but that’s exactly what Chris Stewart was doing when he was hunting brown bears in the Alaskan Tundra. On May 13, 2016, Chris was hunting with Carl Adams, his guide from Becharof Lodge in Egegik, Alaska. On the fourth day of his 10 day hunt, Chris got to experience two of North America’s greatest predators and he was able to get them both. At 6:30 pm, Chris and Carl saw a wolf running and eating gulls nests and they were able to take it with his 7mm magnum rifle. While Chris’ priority was to shoot a bear with a bow, he did have a gun along. Less than two hours later, the duo spotted a brown bear moving toward the ocean from the tundra. It fed in the ocean and the hunters moved towards it but could not catch up. The bear then turned and came back toward them and Chris was able to use a sea wall to move along and get into a position to hopefully get a shot at the bear. The bear cooperated and moved right towards him. Chris laid down so that the bear would not see him, but knew he would have to sit up to shoot and let the bear pass. The bear walked by at 12 yards and at 22 yards, Chris shot the bear through both lungs. The bear dropped after only running 70 yards away and Chris had his first brown bear with a bow. The bear was extremely big and the hunters were surprised at how massive it was. The hide squared out over 10 feet, 6 inches and the skull green scored 29 8/16 inches. The currently Pope and Young world record brown bear skull measurement is 29 3/16 inches, so we’ll see if Chris’ bear holds up after the mandatory 60 day drying period. What an awesome hunt and congratulations to Chris. Hopefully he’ll soon be the new record holder for this massive bear.